These surplus Belt & Drum combination kits are in surplus good to excellent condition. Drums may have some minor handing and storage marks. 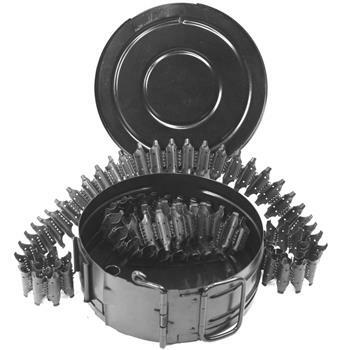 This kit contains one steel drum and one 100 round segmented belt. The belt is a non- disintegrating style and splits at the 50 round location. Exact style of belt you receive may differ from the belt that is pictured.